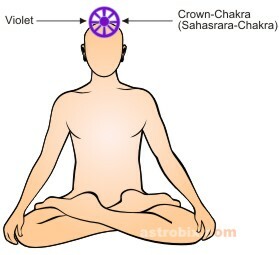 Violet or purple color is related to our Crown Chakra, which is located at the top of the head in the human body. The brain, the pineal gland, and the endocrine system is linked with this Chakra. When people have a good amount of positive energy from the violet color they will have faith and respect for all creatures. They have a sense of self-sacrifice. They are kind hearted and fair. They understand human values and are idealistic. Violet color provokes a person’s interest in black magic and unfair practices or makes him interested in the negative aspect of the spiritual world related to mysticism. They may not bother about others. They may not recognise the truth and tend to turn away from reality. Here are the problems related to Crown Chakra:- Schizophrenia, mental disorders, depression, confusions and problems like fainting. The violet color is helpful in the treatment of all of these diseases. Violet color is concerned with the spiritual personality of a person. This color is helpful from the point of view of meditation, or other spiritual aspects. Include a violet colored clothing item or accessory in your attire regularly. Keep a violet colored piece of crystal or glass in your workplace, or in your home. Use a violet colored night-dress so that you may benefit from the energies while you sleep. Use violet colored bulb or night-lamp. If you don’t find a violet colored bulb, you can use a violet colored film to wrap around a regular white bulb. Include violet color in your home furnishing. Visualize the violet color in your head during the day.